Modern times call for modern solutions to save time and get guys on their way without much fuss. To get your grooming game done in less time I recommend electric razors and hair trimmers that are one and the same. Finally, there are some options for guys that want to be able to shave and trim their beard and neckline with the same tool. With men’s grooming tools coming at us fast and furious, our Dopp bags are starting to weight us down. Time to trim the fat and try out a tool to condense matters and save you time and money. Namely products like the One Blade Pro on Amazon.com, which I will describe in more detail in the article. Let’s dive right in and see what one is going to work best for you. Foil A foil razor has blades beneath a foil cover that rock back and forth. These blades are very sharp but the holes in the foil only allow the hairs to get inside to be cut and not the skin. Foil razors are ideal for people with sensitive skin since the skin really doesn’t make much contact with the blades. To use it you go in up and down motions and not circular. Older models used to have a bad rep because you couldn’t really follow the contours of the face. Newer models have the blades on a cushion, so you can get a close shave on your chin and jawline, for example. Look for models like the Braun Series 7 if you have sensitive skin and angular facial features. Rotary This version has circular shaving heads. Rather than foil, the covers are made of stainless steel and have much more open space. The blades underneath rotate and are not quite as sharp as the foil ones. To shave you go around in a circular motion. You have to go over the same spot quite a bit to get all the hairs. This, and the metal covers over the blades, make this not ideal for those with sensitive skin. To see how they compare more in depth, then check out this article about foil vs rotary electric shavers. Now we have an idea of what you might be looking at by switching from razors to electric razors and hair trimmers. 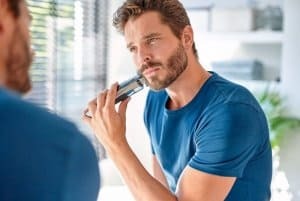 If you still want to look into an electric razor, but think that a 2 in 1 is still your best choice then let’s take a look at the Gillette electric razor that has a blade system for the best of both worlds. How Does the Gillette Electric Razor Work? This is not exactly what you would call an electric razor. I actually kind of think it is better since the Gillette electric razor basically allows you to still shave with a razor, but you get to use the same tool as a trimmer. The way it works is that you have an electric trimmer with the same type of beard trimmer head you would expect. Then the top pops off and you can add another head to it. Still nothing unusual there. But, then instead of just another sized trimmer head, you can pop on a Fusion 5 blade cartridge right onto the body. 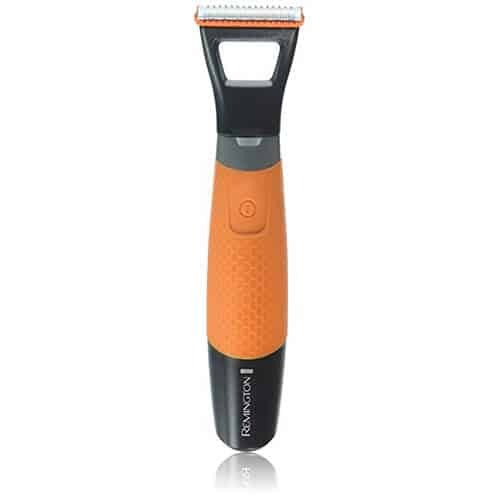 It buzzes like a trimmer so you get an extra close shave. One of the best aspects about it is that it is actually made by Braun and the razor blades are Gillette. I love this since Braun are experts in making these tools whereas Gillette is better at making the blades. Sounds like a good match then! The Gillette electric razor body is slim and fits right in the hands so it is very easy to get around your face and beard. Or, anywhere else, really since you can even use it as a body trimmer. The only downside here is that it is battery operated and not rechargeable so you may go through a lot of batteries if you use it as a manscaper. The trimmer blade can bring your beard down to just above stubble so it can be easily managed by the blade once you get to that point. Edge your beard whatever way you like to get the outline and then do your shave with the blade attachment. It even has an edger on the cartridge so you can get into hard to reach areas where the 5 blades can’t go. There are three comb attachments to put on the trimmer for when you want to take your beard down without shaving it off all the way. And the best part is both attachments, the trimmer, and blade, can be used wet. Save even more time by doing your routine in the shower. You may need a fogless mirror from Amazon.com to be able to see yourself when using the Gillette electric razor, however. There are two different brands and models that are essentially the same thing. They are both electric razors and hair trimmers in one. 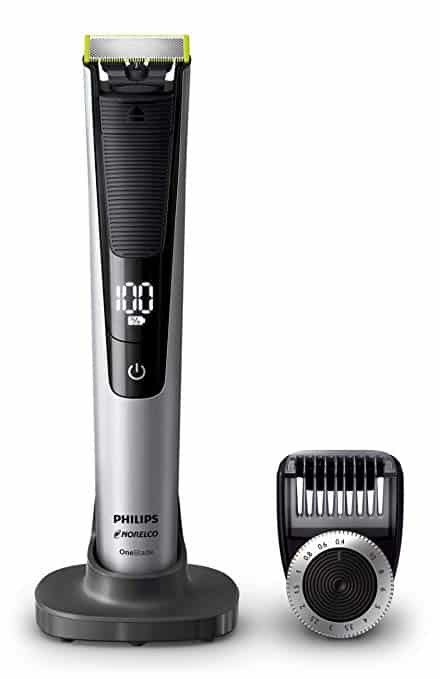 The more well known and popular is the Philips Norelco Oneblade Pro and the other is the Remington DuraBlade Lithium Hybrid Trimmer and Edger. Let’s take a look at how they compare. First, here are the ways they are similar. They both are electric razors and hair trimmers, but you have to realize one thing and that is that they only shave to just below stubble. They are both made for guys with sensitive skin. 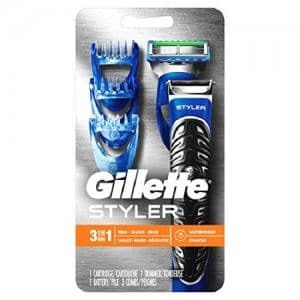 Guys who would normally steer away from using an electric razor since they get irritated will be able to use either of these without getting razor burn. Then they are both foil style razors, just the way the foil works is different than a traditional electric razor. Both of these have flat heads with the foil over the blades. Both have edging blades at either end of the blade so you can simply flip it to its side to trim the edges of your beard or hairline. You don’t need to pop up or slide an attachment, it is always there and ready to go. Enjoy wet or dry shaving from either of them so you can use it in the shower, they are also a cinch to wash by simply rinsing under the faucet if you plan to use it dry. The most obvious one is the price. The Remington Durablade is the cheaper of the two electric razors and hair trimmers by almost a third. Is there a huge downgrade in performance due to the price? Not really. As far as the shave goes, they are both equal. You get 30 minutes of runtime more with the One Blade Pro compared to the 60 minutes of the Durablade. The way they charge could be a deal breaker to some, also. The Durablade uses a USB cable so it can be charged anywhere. The One Blade needs a charging base so you are slightly constrained as to where to charge it. The Durablade can make bringing it on international trips easier because of this too. Another edge the One Blade has is with the attachment comb to change the length you want to trim the beard down to. It has a dial so you only need one comb rather than needing to change the attachment everytime you want to go to another length. Plus, the dial can give you 14 different length settings for way more accuracy. The edge goes to the Durablade when it comes to ergonomics, though. It has a much better shape and the texture really feel non slip. I feel like I would have a more secure grip of this in the shower. Also it feels a lot more sturdy. If I drop it I don’t feel like it would smash. The One Blade I feel like you need to be more gentle with. Lastly, the One Blade Pro has an LED display showing how much battery life is left. If I had to choose one and price was not a factor, I would go for the One Blade Pro. I do like the Durablade quite a bit though. Especially the ergonomics of it are much more friendly in the hand. But since they do an equally good job as electric razors and hair trimmers go, I would likely pick the Durablade rather than the One Blade if I didn’t want to spend too much. The One Blade is not that much better to warrant such a big difference in price. With any of the three trimmers and shaver hybrids, I covered today you can make your life so much easier. They are all slim and ergonomic and offer a lot of flexibility. All without compromising on performance. If there is anything I can’t stand, it’s a tool that tries to do too many things and ends up being mediocre at everything. That is not the case here. Do you need more information about any of the tools I reviewed here? Let me know by dropping a comment in the box below and I will get right back to you to help.